Yukon's NRB 20x Newtonian Reflector Binoculars provide exceptional performance in all viewing conditions but where designed specifically with the needs of long distance observer in mind. The incredibly high magnification of a 20x binocular is a terrific choice for distant bird watching, astronomy, and other activities that require high-power optics. The lenses of Yukon NRB are fully multicoated to ensure high light gathering capabilities as well as providing exceptional contrast and resolution. With the help of the YukonTM NRB, the furthest objects can be admired in great detail, with comfort and clarity. NRB's stylish and compact design features our rugged covering of rubber armor. The YukonTM NRB is lightweight making it easy to use this powerful binocular in all outdoors activities. With Yukon's NRB 30x there is no excuse to say that an event or object is too distant to see clearly. Included: Deluxe Padded Soft Carrying Case, Rain-Guard Lens Covers and Neck Strap. 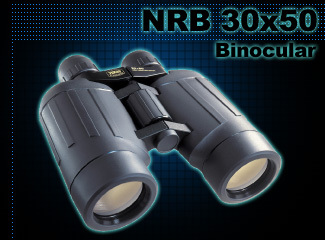 The Yukon NRB 30 x 50 is a Newtonian Reflector Binocular that keeps size and weight to a minimum considering the extremely high 30x image magnification. Fully multicoated optics maximise light gathering, contrast and resolution.